From the chef and host of A Taste of History comes a beautiful cookbook that features 100 elegant dessert recipes from America’s earliest days and will capture the grandeur of the sweet table—the grand finale course of an 18th century meal. At this time it was common for hostesses to arrange elaborate sweet tables that were designed as works of art. 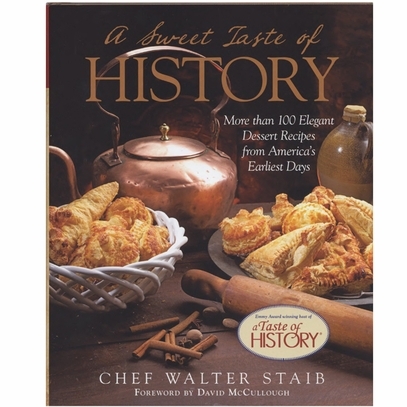 A Sweet Taste of History will blend American history with exquisite recipes and it will show the reader not only how to recreate these incredible desserts but will also discuss the importance of each one, the social story behind them, and how these dishes landed on the tables of early Americans. This gorgeous cookbook blends American history with exquisite recipes. Includes Thomas Jefferson’s recipes for Vanilla Bean Ice Cream and Floating Island or Snow Eggs. Foreword written by historian David McCullough. Hardback, 236 pages.